Kai-V If I Take Picture By Me But It's My Friend Beyblade it's Okay or not? (Jul. 14, 2012 4:54 AM)Ezik Wrote: Kai-V If I Take Picture By Me But It's My Friend Beyblade it's Okay or not? Who is your friend ? Is he a Member here ? Everyone, you have to remember that photography is not only about picture quality : it is also mainly about doing an effort with the placement of the elements in the frame, doing an effort with the lighting, trying to put meaning in the overall piece, etc. If you have all of that, who cares that the photograph has a lot of 'dust'. Wow i love this contest .Can I enter? Even in post-apocalyptic worlds, everyone loves Beyblade! 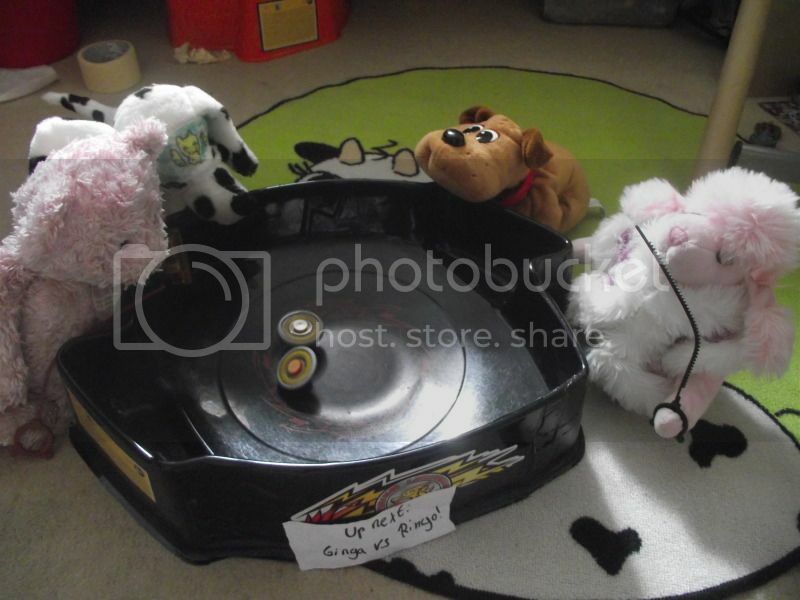 This picture is of WALL-E having combined the parts surrounding him to make his very own Beyblade. There are three previous attempts next to him, and parts all around him. Everything in this picture is Beyblade related other than WALL-E and his two treads in the part piles. The blocks in the background are old Hasbro ripcord launchers from the plastic generation with the prongs removed (good lord, they are hard to stack! ), and they're meant to look like the trash cubes WALL-E stacks in his movie. The part piles are comprised of lots of pieces of Beyblades that I have, all MFB. The Beyblade WALL-E is making was painted to have a matching color scheme as WALL-E and the metal wheel's paint is even worn down to look weathered (it's kinda hard to see in this picture, but this is the best angle I could come up with). I took the picture with my phone's absolutely phenomenal 8 megapixel camera. The darkening around the edges was an effect that my phone has when I take a picture, and the dusty clouds were added in afterward in GIMP. I tried not to go overboard with the editing since this is a photography contest. I hope you guys like it! There's a bigger version in the spoiler if you want to see that (I'm using said bigger version as my desktop background, haha!). Damn, Ingulit's totally got this in the bag, man, what a picture!!! Awesome indeed Inguilt. Superb picture. I wonder if Benjohadi will be entering this time. If he enters, he will surely get a prize(like he always does XD). I'll try getting some good photographs too once the sun is out. The arrival of monsoon here has washed down my hopes of seeing the sun though. Expect me to get the fastest stuff. Awesome Picture Inquilt. But I bet the Competition will be tough.. 5 MP is fine right guys? Might enter this, I've a few ideas. Plus, you could get the URL off facebook... that's what I did. You should use a better image host, though... Facebook compresses images heavily, making them look much fuzzier. Title: "I'd Rather Be Green Than Be Blue"
I'M TOO OLD FOR BEYBLADES! Great job on that photo Inguilt! Really well done. TheHentist Well I Like you both beyblade. Nice Picture. Green Pegasis is from limit version on eBay. The Green GP is from BB-75 Beyblade Deck Entry Set. It is not a limited edition but an exclusive recolor of GP in the set.